Yes, I can’t believe that this is happening either. It dawned on me that while I claim this is a blog is about like 7 different card games, we only ever talk about Yugioh (mostly due to the fact that Yugioh is easy to write about). So in an attempt to try something completely different I’m going to go into way too much detail about my only EDH/Commander deck Kangee, Aerie Keeper which is essentially Blue/White Bird tribal. Why of all the possible EDH generals are you playing this? So despite having access to many Magic cards, this became my only EDH deck to not get scraped/sold when my local meta became nothing, but Storm and Infinite Combos. While I had many decks at one point this is somehow only deck I somehow really cared for. What does this thing actually do and why should I remotely care? Kangee, Aerie Keeper is a 2 generic, 1 white, 1 blue legendary bird wizard (high ho erratas) that reads Kicker 2x, when Kangee enters the battlefield put x feather counters on it if it was kicked (an additional mana cost you can choose to pay). Other birds get +1/+1 for each feather counter on Kangee (Erratas reee). Now wait a second here… Isn’t Derevi, Empyrial Tactician a Bird Wizard too? Isn’t he an infinitely better commander in far better colors ??? Yes, that’s all true. Derevi is a good commander that’s also a bird. He also gives access to the birds in Green (one of which we all know about and many others that we don’t). Why don’t I just play Derevi instead? Well think for a moment about the type of mindset that makes one consider playing BIRD tribal at all. If I said I came here with the aspiration of winning that would be a boldface lie. To be fair birds aren’t a bad tribe. Flying is and will always be a good keyword, giving every bird essentially pseudo-unblockable. Furthermore, as a result of being fairly common in world-building there are tons of these darn things. The stats of almost every bird are also pathetically weak as if to add insult to injury. So how do we get anywhere with a tribe of non-synergistic weak creatures? In order to survive the horrible situation you’ve knowingly put yourself into by playing birds you need a solid strategy that makes the best use of these fowls. For example, I play a very low to the ground (hah!) aggro deck that uses very low cost birds and many high-end anthem effects. The creatures I use are typically 2-3 drops like Welkin Tern and the anthem effects are 3-5 drops like Gravitational Shift. I have tried multiple variants of bird tribal and would not claim my current build to be the best one. I’ll discuss some more variants later on. In a sky of creatures barely above your 5th draft pick, an actually good bird soars above the average mediocrity of the flock. This is one of the only birds in the game that’s actually a good creature worthy of competitive play. Aven Mindcensor pretty much stops your opponents from searching their decks and can be flashed in allowing you to hold up counter-spell mana (You are a Blue deck after all). This card does everything you could possibly want other than hit for big. This card is really good in combination with many cards in the deck. It adds counters to Kangee, Door of Destinies and Soulcatcher’s Aerie. While normally just a 1/1 for 2 mana it synergies very well with many other cards. It makes your birds cost less. By bird standards this thing is amazing. Need I say more? While not a bird technically, this card is on the short list of ways that you can actually kill someone with this deck. Use its effect, make your flock have actually respectable stats and then hit one player for big. This is as close to win condition as we’re going to get people. How are we going to play to the Alfred Hitchcock “Birds” theme if the flock isn’t always watching?! This makes it so your birds can attack and block (in theory). It’s also another solid anthem effect. So after your birds inevitably die a painful death and you have nothing to your name, this card is one of the best ways to revive your crew and prepare for another attack on the next turn. Also anthems for the win. This is an absolute gem of a card. It turns your birds dying into a positive as every subsequent bird you cast becomes larger and larger. I’ve gotten 8 counters on this card before which made every bird I top-decked an actual threat. It’s slow in the early game, but amazing late game. This is quite frankly amazing. Another card that makes the death of your birds hurt less. There are also many birds with 1 toughness you can just kill to draw more cards (until you start stacking anthem effects ofc). I play Obelisk of Urd over Door of Destinies (gasp!) because I like the immediate +2/+2 boost over the eventual high end boost of the Door. Both do the same thing essentially as an artifact anthem though. Migratory Route is the only “staple” here. These are just some of the cards you can play that I find acceptable (or the case of Sphinx’s Rev actually good). I highly recommend Counterspells to protect your birds though. This is by no means the best (or likely even decent) way to build the deck. My greatest success is usually just killing one player before running out of resources or hitting one player for big damage. I do enjoy this deck (more than any normal person should) because once you get the chain of anthem effects going it’s very satisfying to see just how big you can grow a tiny little Storm Crow. Here are some other ideas I had for the deck. You could drop the low cmc birds and focus on ramping into huge birds instead. Some of these creatures actually have decent stats/effects. Aven Fateshaper is efficient card filtering and Aven Brigier is a cheaper anthem than Kangee (he also rewards using bird soldiers). Other than Migratory Route, there are many cards that make bird tokens (more than I listed ofc). With Eyes in the Skies and Scion of Vitu-Ghazi you can make a flock of tokens to attack the enemy. Playing tokens also gives you access to the anthem Intangible Virtue and the wrath protection using cards like Rootborn Defenses (which also makes you even more bird tokens!). I honestly forgot this was a card until I added it last night. It could be a good general, especially since the partner mechanic can give us access to green and thus ramp! That being said it might lead us down the long and dark path to just being discount awful Derevi deck (my greatest of fears). Alright, I’ve discussed this more than anyone ever should have. What card games do I actually play? OK, time to condense the last 10 years of my card game experience into a quick post to explain my madness, my methodology and my… (I need other word starting with “M”) muse? Yugioh (Casually, but it’s the game I understand most). Magic the Gathering (Competitively if only for Draft, otherwise I’m totally casual). Pokemon (Casually since I only have a few totally illegal decks based on my favorite cards). My Little Pony (Casually, since I don’t believe I’ve ever played the game correctly). Naruto (Casually, since my only opponent has been the old friend who dragged me back into the game, granted it’s been a blast). I plan to break my posting into some kind of one card game each day schedule (Magic Monday, Wixoss Wednesday, etc.). In the meantime I’ll try to explain (in another post) why I play multiple games at once, what my definition of play means and how I’ve grown as a player from doing so. 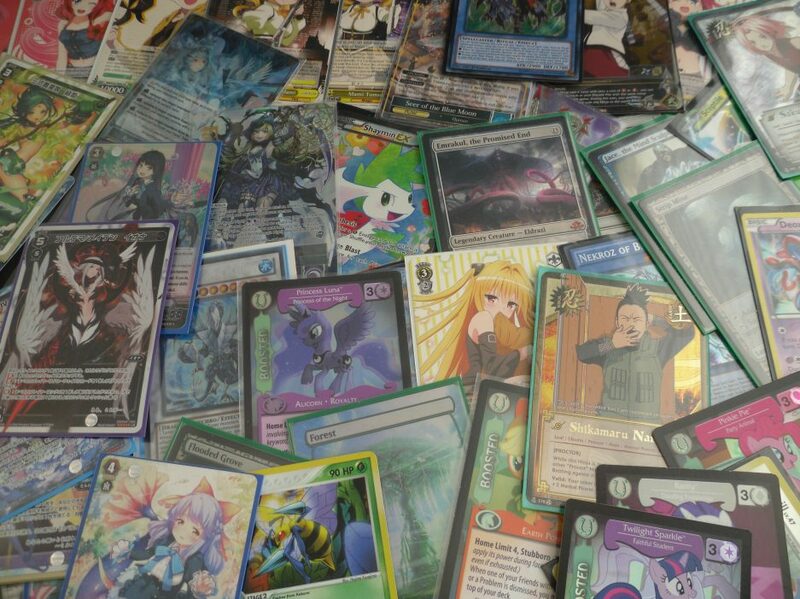 With this blog I want to discuss one of my favorite hobbies, trading card games. At 20, I’ve already spent far too many years and way too much money on various pieces of cardboard with desirable artwork. So now I hope to give what little insights I can to anyone interested in learning, improving or making money out of this medium. This is my 1st real attempt at blogging so I’m certain to screw up at times and when I do I apologize. I hope I can entertain, inform and share information as a man who currently plays and collects 5 different card games (while both designing his own and trying to start playing even more). Thanks for taking the plunge with me on this wild ride.